"You never really know someone until you fight them." 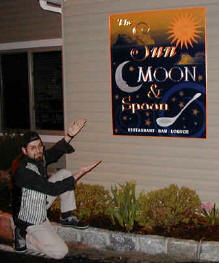 The Sun Moon & Spoon is an excellent restaurant located on the Hudson river in Hastings New York. Shown here is the finished front sign which was designed in Illustrator. A long horizontal sign was designed for the outside fence as well. The Illustrator files were used by Northport Woodsmiths to carve the shapes in the final wood sign. They used a special machine that referenced the vector information in the illustrator file directly to cut the shapes. Then they hand-painted the colors and airbrushed in the clouds. Also the lettering was finished with gold and silver plating. 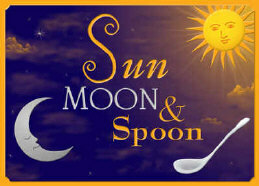 We also designed postcards, business cards, menu covers, and other indoor signage for the restaurant. Shown to the right, here, is a postcard design. I used Metacreations Painter to paint the sky image in the background, and then layered illustrator objects from the original sign. 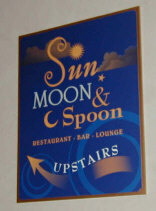 Here's an image of one of the indoor signs designed for the restaurant. This was printed on a hard acetate like material with a gold border. Other signs were also created for the main door and bathrooms.